Official death toll at Reigners Bible Church is now 50, other estimates put the figure at 160. Rescue workers are still battling to evacuate victims in the Reigners Bible Church in Uyo, following Saturday Service roof collapse in the church. Senior Akwa Ibom State government officials are suspected to be among the victims as well. NAN reports say the building was still under construction at the time of the collapse. Witness say the building collapsed about 30 minutes after the arrival of the governor. Akwa Ibom Governor Udom Emmanuel was a guest at the Reigners Bible Church for the consecration service of the Founder of the church, Apostle Akan. The Governor and the Founder were said to have escaped unhurt as the building collapsed. NAN reports say the building was still under construction at the time of the collapse. Witness say the building collapsed about 30 minutes after the arrival of the governor. The collapse of the Lodge in Synagogue Church of all nations in Lagos killing 115 people in 2014 is still an ongoing row between Nigeria and South-Africa. These are avoidable tragedies. Not just in Uyo but rest of Africa and beyond. Engineers, architects are not trained to construct buildings that will kill people 30 minutes into a service. A Six-story building in Nairobi collapses killing 12, injuring 132 . The cause of the collapse was attributed to “heavy rains”. Since when did it become LEGAL for heavy rains to cause the collapse of buildings? Another three-storey building in Mumbai, India collapses most of the Victims are believed to be construction workers who were involved in the building repair works. In Nairobi, Kenya, the Red Cross said 150 building units and adjacent homes were affected. 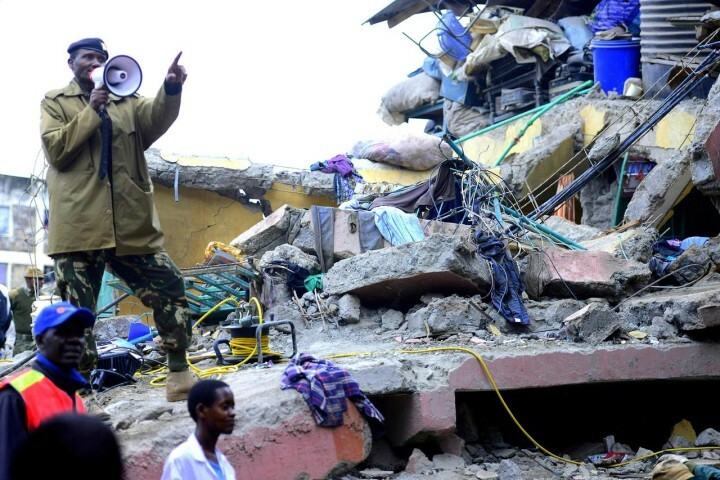 Rescuers could hear voices of five people trapped in the building and said it would be difficult to remove the concrete slabs using heavy machinery without endangering those stuck in the rubble, said nominated legislator Johnson Sakaja. The building didn’t have an occupancy permit, which is a government requirement for all buildings, said Stephen Oundo, the chairman of the National Construction Authority. Police Inspector General Joseph Boinnet ordered the owner of the building to surrender himself to the police for questioning. Jacob Kiruma, who said he lived in the house adjacent to the building that collapsed, said the structure had been built in less than five months and the 126 single rooms were quickly occupied at a rent of $35 a month. Area legislator Stephen Kariuki said this was the second building to collapse in a year and blamed the county government of failing to follow through with demolitions of buildings that were identified as unfit for human habitation. Since when did it become LEGAL for heavy rains to cause the collapse of buildings? … Or an ongoing road excavation a reasonable explanation for collapse? The heavy rains have caused other fatalities. Four people died when a wall collapsed Friday in the affluent Hurlingham area and two people drowned when they were swept away by floodwaters in the capital’s industrial area, said Mr Koome, the Nairobi police chief. 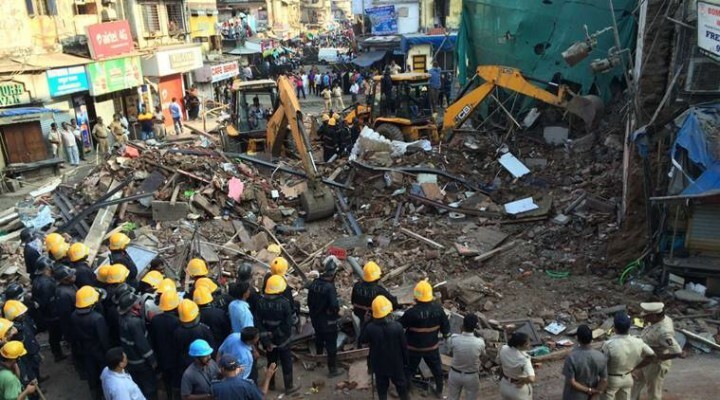 A report in Mumbai, India has it that SIX people died and two others suffered injuries after the collapse in Kamathipura on Saturday. The building, named Gulmohar, was over a hundred years old and was undergoing repair work, which was being overseen by the MHADA, a Building company. Though the building was listed as a residential building, as per MHADA’S records no one was living in the building. MHADA officials said that there was a restaurant on the ground floor and a few embroidery workshops on the floors above. Onlookers said that the building completely collapsed in a matter of minutes. “There was a loud crash and the next thing we knew, the building was gone in less than five minutes. The locals and some NGOs in the area rushed to help the people who were trapped inside,” said Moinuddin Siddique, a resident of the area. A majority of the eight rescued are believed to have been construction workers who were involved in the repair work of the building. “The people who were in the building when it collapsed include four brothers and their nephew. They had been working at the building for a month and a half and also lived there,” said Arjan Mullah, a relative of the family. Despite being over a hundred years old, the building, as per MHADA’s records was not declared dilapidated. The repair work of the building was being funded by MLA Amin Patel who has raised questions over the inspection of the building by the MHADA officials. “If an engineer is not able to determine whether a building is dilapidated or not, what kind of an inspection is being carried out? A probe will be carried out and the persons responsible for this will be penalised,” said Patel. The work order for the repair work of Gulmohar building, which was supposed to continue for the next eight months, was issued on April 28. The MHADA insisted that the building did not show any cracks or signs of being in a dangerous condition. “We had conducted a visual inspection of the building and had not found the building to be dilapidated. The building had a conventional structure with load-bearing walls and wooden beams. There were no signs of the building being dilapidated,” said Sanjay Jadhav, the in-charge executive engineer of MHADA. Next question for all will be how come it collapsed, suddenly? Dr S.A Oloyede, Covenant University, Ota, opined that a building, once properly constructed is expected to be in use for a very long time. Although every society has its own problems and Nigeria is not an exception yet the very recent challenges of buildings collapsing in various locations have been giving the various arms of government and the people of Nigeria sleepless nights in view of the enormous loss of huge investments in housing, properties and human life. The major challenge on the issue of building collapse is that individuals differ radically from one another on the professional to blame as the major cause of the collapse of a building. First, building experts blamed building collapses on the use of low-quality building materials coupled with employment of incompetent artisans and weak supervision of workmen on site. Second, findings revealed that the blames of building collapse were due to non-compliance with specifications/standards, use of substandard building materials and equipment and the employment of incompetent contractors. Third, the opinion of the academia on remote causes of building collapse showed that the route causes are mainly the non-enforcement of existing laws and endemic poor work ethics of Nigerians at large. In addition, government all over the world should, on one hand, embark on proactive steps by mustering enough political will to allow the Town Planning Authorities to perform their functions unfettered and on the other hand, provide the legal framework that can improve and ensure smoother, less time-consuming and less burdensome ways to conduct business in the functioning of law courts.